Apparently, the Russians have been up to some bombastic, big motor madness for quite some time, and when we consider the nature of the Russian experience, it only stands to reason that they’ve been running big, crazy, high center of gravity, diesel-powered tractors in mud races for years. Think of it. The Russians are renowned for their hard scrabble, brute force approach to life. Legend has it that MiG pilots carried a tool box on their planes, and were able to land their damaged crafts in cow pastures, where they could wrench them back in to the sky with their hands, some lithium grease, and a socket set. Brilliant. American pilots of course were beholden to large support crews and avionics that did not respond well to field fixes. You really have to hand it to the Russians. In fact, I knew one in Southern California who threw his own cell phone into the ocean after his friend threatened to throw it for him if he didn’t turn off his ringer, which blasted Tchaikovsky each time it rang, which on this particular sport fishing trip was constant. There it is: He embraced the brutality and made it his own, electing to sacrifice his phone on general principle. It’s a very Russian attitude and one that has carried them through many beak situations. 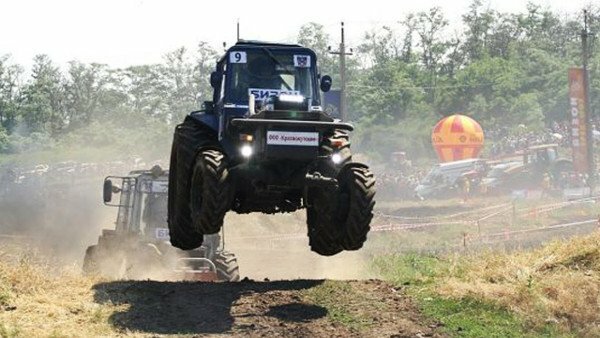 For this reason, and with this understanding of the Russian condition, watching them bomb around a mud and dirt track in what are essentially stock farm tractors with enhanced power plants is encouraging, and really a blast to watch. They’re actually called flying tractors, which makes them even better, and certainly plays well with the legend of the Mig pilots and the cow fields. We may have beat them to the moon, but they’re racing flying tractors, and with any luck, there’s vodka involved.